The malt sweetness comes through first creating a very smooth and creamy mouthfeel. Much like what you would expect from a Marzan. The malt gives way to the hops that give an gentle bitterness that gains some momentum towards the finish. The flavorful mixture of bready malts, bittersweet chocolate and citrus hops create a balanced and very tasty American style Oktoberfest beer. Finish is dry and clean. Appearance: Pours a copper-red with a two-finger, off-white head. Head recedes slowly leaving behind incredible lacing that looks like it’s been painted on. Very attractive looking beer. Smell: The first thing I noticed was the hops, they are quite fragrant but in no way do they seem overwhelming. The sweetness from the 3 different styles of malt helps to add some balance to the nose. There is a subtle fruitiness in the finish. Initial Taste: The malt sweetness comes through first creating a very smooth and creamy mouth-feel. Much like what you would expect from a Marzan. The malt gives way to the hops that give a welcome but gentle bitterness that gains a little momentum towards the finish. The flavorful mixture of bready malts, bittersweet chocolate and citrus hops create a balanced and very tasty Oktoberfest beer. Finish is dry and clean making this high in drinkability. Thoughts: Like many of the other American craft Oktoberfest beers this is an American style Oktoberfest. 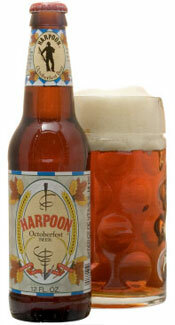 Which really isn’t a true German Oktoberfest beer but rather a Marzan boosted with hops (us Americans love our hops!). That being said, this beer is one of the best available for the style. Harpoon has created a perfect balance with what is traditionally a malty beer. They have mixed three different kinds of malt (chocolate, Munich and pale) with tettnang hops that give a spicy flavor that balances out the sweetness. The end result is a beautifully smooth beer that delivers on both the sweet and hop front making this a great session brew. This easily has become my go-to beer for American Oktoberfests. I highly recommend to Oktoberfest and craft beer lovers alike.